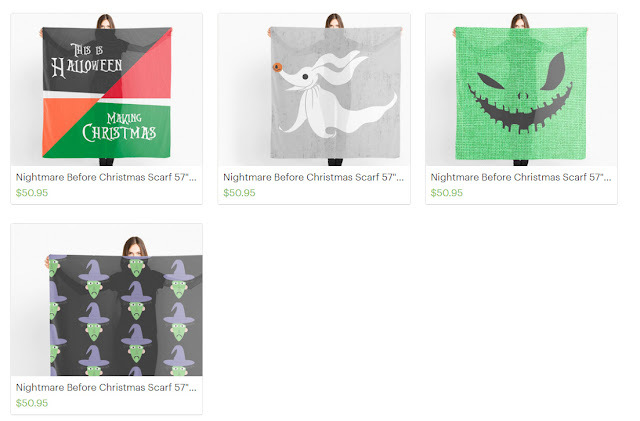 Here's some adorable lightweight Nightmare Before Christmas scarves that I thought might be perfect for spring. They won't keep you warm or keep rain off of you, but they'll wittily accessorize your springtime goth outfits. They're from a shop called Canis Picta that sells all sorts of cool pop-culture goodies. 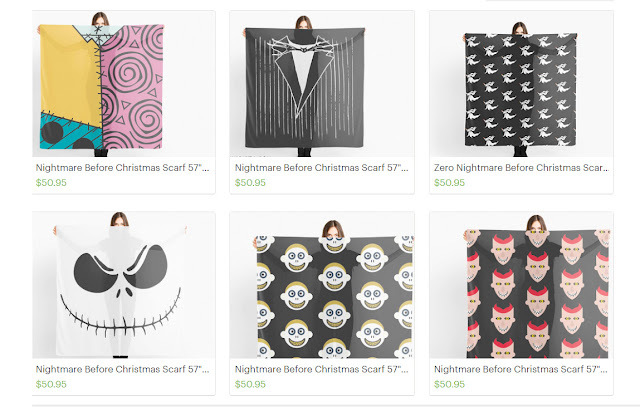 Their Nightmare Before Christmas scarf selection includes Zero's face, Zero in a repeating pattern, Sally's dress print, Jack Skellington's face, Shock, Lock, Barrel, a combo of This is Halloween/Making Christmas, and Jack Skellington's suit print. I'd have a hard time deciding - Which one tempts you the most? It occurs to me that these are so large, I might drape them over a table, a bookcase, or another area of my home for a nice dark decorating touch!